Looking for the perfect appetizer for a party, game day, or a great snack for the whole family? It doesn’t get any better than Stromboli! Moist bread, gooey cheese, salty pepperoni… how can you beat that? Combine the warm water, yeast and 2tsp of sugar in a bowl and set in a warm area for 15 minutes to allow the yeast to activate. The yeast should create a creamy layer above the water (called the “bloom”). In a mixing bowl combine the flour, salt and 1/4c of sugar. Add the yeast/water mixture and begin mixing on low, using a dough hook attachment, and slowly add the melted butter. Mix for 2-3 minutes… The dough should be wet and tacky, if it is not add another tablespoon or two of warm water and mix for an additional 1 minute. Stop mixing the dough and allow it to rest for 5 minutes. This gives the gluten a chance to relax and spread back throughout the dough. Once rested, mix for an additional 3 minutes at medium speed. The dough should have pulled from the sides of the bowl and be slightly elastic. Turn out your dough onto a lightly floured cool surface and knead it until it develops a slightly elastic consistency, approximately 6-8 minutes. Add small amounts of flour to the surface as needed while kneading. Place the dough in a large bowl and coat it thoroughly with 1tbsp of olive oil. Cover with plastic wrap and a towel and set the bowl in a warm, draft free place until the dough doubles in size, approximately 1 hour. Turn the dough back out onto the lightly floured surface. Do not knead it, simply release some of the air by gently pressing it with your fingers. Using your hands, press the dough out into a large rectangle, roughly 16×20″. Layer the shredded mozzarella over the spread dough, leaving 2″ bare at the top and bottom edges, and 1″ along the sides. Evenly spread the oregano, garlic powder and grated parmesan over the mozzarella, then evenly layer the sliced pepperoni. Starting from the end closest to you, fold over the 2″ of bare dough then continue to gently roll the dough moving towards the opposite edge, folding in the ends before each roll. Place parchment paper over a large baking sheet and coat it with cooking spray, then place the rolled Stromboli on the sheet with the crease on the bottom. Cover with a towel and set in a warm place for 20 minutes to allow the dough to begin rising again. 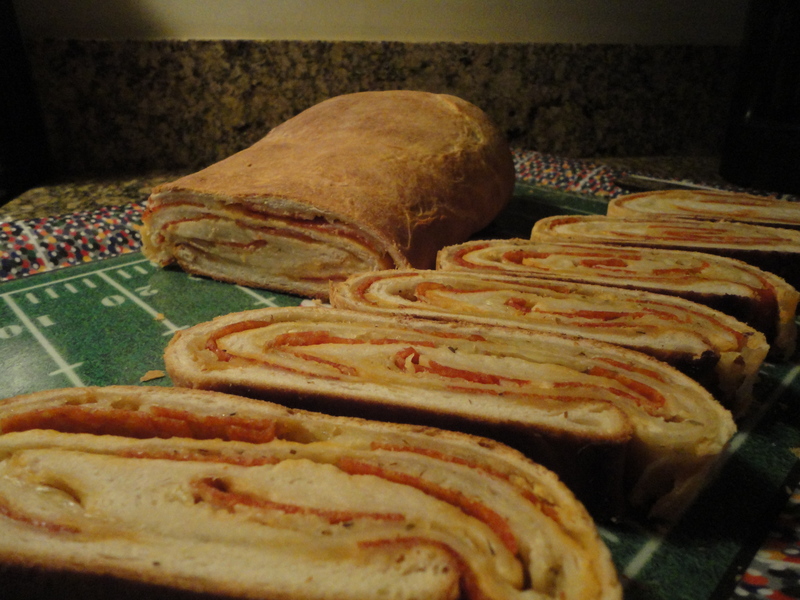 Brush the Stromboli with 1tbsp of olive oil, then place it in the preheated oven. Bake for 30-35 minutes, until the top is browned. Allow to cool at room temperature for 15 minutes before cutting and serving. Tags: appetizers, bread, cheese, cooking, food, game day, italian food, pepperoni, perfect pairings, perfect pairings at home, snacks. Bookmark the permalink.